It’s the week of Christmas! GIFTS are being bought, wrapped and delivered all over the country. We have so much to be thankful for as we consider the many GIFTS we have received from family, friends and our Heavenly Father. GIFTS are not truly enjoyed until they are received. How are you at receiving GIFTS? Are you a good receiver? Can you accept a GIFT with genuine gratitude? Do you ever feel uncomfortable when an expensive or unexpected GIFT is given to you? Do you feel unworthy? Do you feel you need to “pay the person back” with a GIFT of equal value? GIFTS completely lose their purpose if they are not unconditionally GIVEN and unconditionally received. We should choose to receive with thanksgiving and refuse any negative thought or uncomfortable feeling. We have an enemy who loves to steal, kill and destroy the purpose in a heartfelt GIFT. 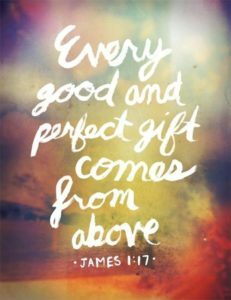 Are you aware of all of the GIFTS we have been given In Christ? It’s like we are sitting on a bank account of unlimited funds but many times live as though we have very little. I challenge you to discover all of the promises in God’s word written to you and to me. First we need to be aware of what we have in Christ and then we need to decide if we are going to believe what God’s word says. If you have trouble believing it I encourage you to say the truth of God’s word out loud! God’s word tells us that we have been GIVEN everything we need for life and godliness. (II Peter 1:3). We have been GIVEN a specific measure of grace that is the exact amount we need. (Eph. 4:7) We have been GIVEN power and a sound mind. (II Tim. 1:7). We have been GIVEN victory. (I Cor. 15:57). What GIFT do you need from Him today? God is a GIVER! And He wants us to ask Him for what we need. (Matt. 7:7). I believe He also wants us to ask Him for what we desire. It is my prayer that we discover the many GIFTS HE has already given AND that we ask Him for the heartfelt longings we still desire. Get ready to receive! Did you know that you were a gift from God to Jesus? Listen to Hebrews 2:13b – Jesus says, “Here am I, and the children God has GIVEN me.” YOU are a valuable gift! Jesus was thrilled when HE received the GIFT of you! That may be a new thought for some of you reading this blog. Soak it in and meditate on it. God chose you as a priceless GIFT for His son! And HE had no trouble receiving you. Remember the story of the prodigal son? The Father ran to the son. He grabbed him, kissed him and put a robe on him and a ring on his finger. You were received with great enthusiasm!